There isn’t a shortage of Thai eateries popping up around our island and it seems like the burning flame for its fiery cuisine isn’t dying any time soon! 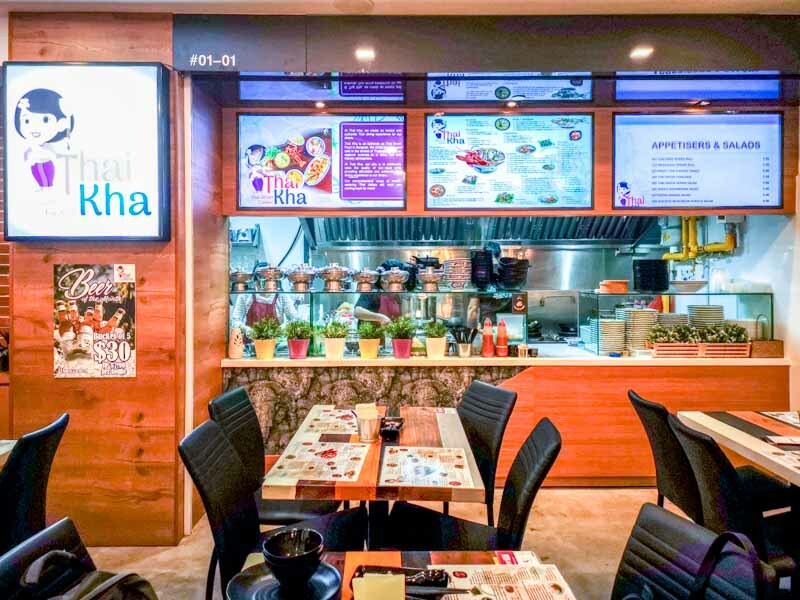 A new entrant to the scene is Thai Kha SG, located at Havelock Road. Claiming to serve authentic Thai street fare, the dish variety on its menu are aplenty and very reasonably priced. Considering the building does not see much foot traffic, you’ll be glad to have discovered this gem. Sharing here is made easy with their Super Thai Kha (S$29.90), loaded with Crispy Thai Chicken Wings, Fried Basil Spring Rolls, Thai Spiced Fishcake, Green Mango Salad, Green Curry Chicken, Braised Pork Leg, Thai-Style Flower Crab and Mussels. More than sufficient for sharing among three to four diners, the seafood was exceptionally sweet and fresh. My personal favourite was the actually the Green Curry Chicken, that had a generous amount of chicken chunks stewed in a creamy green curry that had a great balance of sweet and spicy. There’s more to Thai salads than your rudimentary papaya version. This Thai Waterfall Pork Salad (S$8.90) was not only savoury, but also really addictive. I reckon if you’re not up to a full meal, just having this for a quick lunch would suffice. The pork was tender and full-flavoured from the fish sauce and chilli dressing, while the crunchy greens gave the dish a great textural contrast. Another simple dish on the menu that’ll blow you away is the Thai Boat Beef Noodles (S$7.90). Yes, I’m aware that there are Thai boat noodles out there for a fraction of the price, but this bowl at Thai Kha SG is worth every cent. The broth was aromatic and subtly sweet on the first sip. It was then that I could taste just how much body this modest dish held; I was more than happy just sipping on spoonfuls of broth. There was no shortage of beef slices and beef balls, making this dish incredibly comforting and effortless to polish off! The highlight of the meal was for sure, the Super Size Red Tom Yum Soup With Lobster (S$49.90). Sure, it might seem like an overkill to fork out almost S$50 for just soup, but given it’s made to serve up to four people and it tastes pretty phenomenal, I would confidently recommend this dish! The pot may look intimidatingly bright red, but in terms of spiciness, I would say it’s very tolerable. What got me hooked was the generous amount of seafood and the rich soup base. No need to worry about having to struggle with cracking the lobster either, as it’s already been conveniently cracked for you. All that’s left to do was to break along the crack lines and pull to reveal the succulent flesh. Dessert called, and Thai Sweet Tapioca (S$4.90) really impressed me. I’m not a usual fan of anything with tapioca due to its starchy and fibrous texture. However, this really completed the meal for me with its sweet, milky coconut drizzle atop amazingly soft and warm tapioca chunks. It’s odd how usually mundane dishes came alive here, during my lunch visit. I didn’t only find them delicious, but it has made me want to return to try the rest of the menu. Although it’s not the first choice for authentic Thai fare, you’ll want to add Thai Kha SG to your list of must-visits.